We focus on providing comedy for your Bar Mitzvah and Bat Mitzvah parties with Family-Friendly Entertainment utilizing the highest of moral content to celebrate this rite of passage. We provide a series of comedy, game shows and murder mystery dinners that can be tailored to any needs that you may have to help you to celebrate this coming of age event. A rite of passage is a key element of a child joining adult society. Every religion finds this to be key to societal structure and celebrating such a rite of passage becomes a community event. Nothing makes a Bar Mitzvah party for faith-based entertainment more successful than improv comedy. With family-friendly entertainment for Jewish celebrations and formats that can fit almost any audience or venue, look to us for your entertainment needs. Contact us for your Bar Mitzvah parties by emailing us today. If you are looking to entertain a group with a Bar Mitzvah or Bat Mitzvah party, family-friendly humor made up on the spot can provide just the kick you are looking for to take the event to the next level. The Bar Mitzvah boy or Bat Mitzvah girl could be made the center of attention and we work hard to make them look like rock stars. 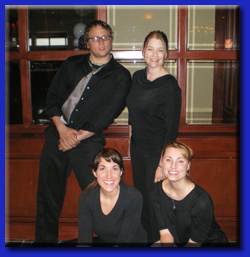 With a collection of improv comedy, game shows and murder mystery dinners, we work with you to develop a program that will meet your needs within your budgetary constraints. We talk to you and the Bar Mitzvah boy or Bat Mitzvah girl to ask about the kind of entertainment that they would like for their party. We try to come up with something that they'll remember and that you and your Synagogue or Temple will enjoy as well. This helps us to ensure that your group will have a good time as the Jewish community welcomes its newest adult.